What’s the deal with MVNOs? Mobile Virtual Network Operators don’t maintain their own network infrastructure - instead they lease access at wholesale rates from the big four (Verizon, Sprint, AT&T & T-Mobile). They market their own brands and provide their own customer support. 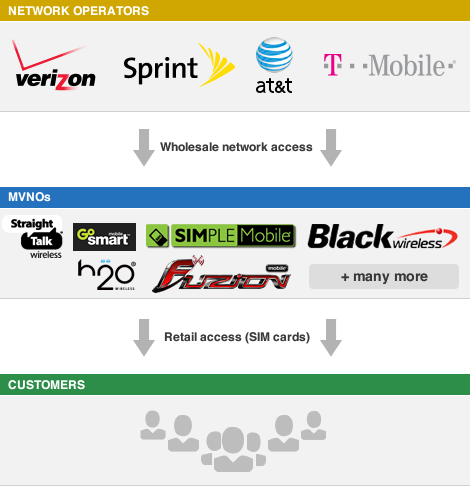 MVNOs are common abroad, and are gaining momentum in the US. They provide access to the same networks without contracts, and at cheaper rates. The Moto G is a mid-level unlocked smartphone that starts at $179. Google's Nexus 5 is a powerful unlocked smartphone that starts at $349. You can purchase new & used smartphones on eBay. You can complete your contract, or pay a fee to break it, and bring your own phone (e.g. AT&T's unlock page page). You can purchase a new phone outright. T-Mobile offers the latest unlocked smartphones. Cricket Wireless offers the best deal on a retail Galaxy S5 ($589.99). How can I keep my old number? Some providers allow your existing number to be ported across, but we recommend using Google Voice to manage your phone number. Once you’ve ported your number to (or chosen a new one from) Google Voice, you can switch prepaid providers at will with ease. You could even try a different one each month - the switching cost is very low when you’re not on contract.